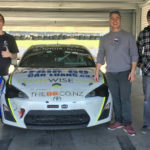 The journey to the starting line for the 2018-2019 Toyota 86 Championship might have been a different one - a very different one - for seventeen-year-old Peter Vodanovich, but the goal remains clear for the St Kentigern College racer - victory. Vodanovich doesn't have a background in karting as so many racing drivers of all levels do. His skill set..